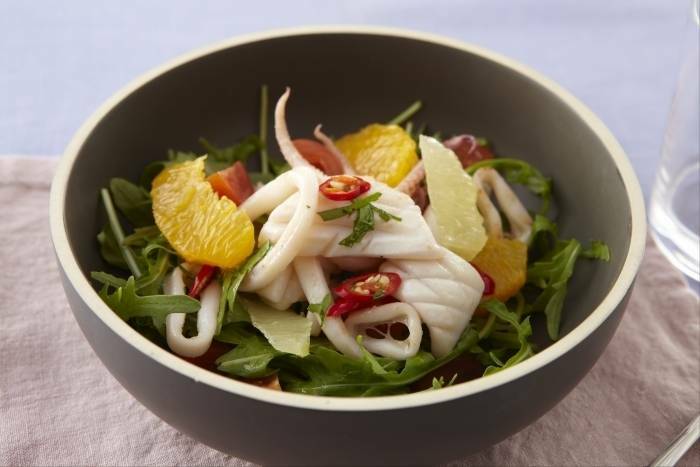 Baby squid rings quickly sauteed and served with a salad of rocket, citrus fruit and chilli spiced pan juices. Separate the body from the squid tentacles. Rinse the squid tube under cold running water to remove any grit. Slice the body into half centimetre thick rings. Remove the head from the tentacles and discard. Rinse the tentacles and dry all of the prepared squid on kitchen paper. Peel and finely dice the shallot and garlic cloves. Pick the mint and coriander and roughly chop. Finely slice the chilli. Remove the skin and pith from the oranges and the lemon. Remove the segments and keep to one side. Wash the rocket and dry in a salad spinner. Keep refrigerated. Wash the cherry tomatoes and cut in half. Heat a frying pan until very hot and add a splash of sunflower oil. Season the baby squid with salt and pepper and add to the pan. Cook for 1 minute until the squid rings are golden brown. Remove the pan from the heat and add the chopped garlic and shallot. Stir the chopped garlic through the squid and remove the squid from the pan. Place the pan back on the heat and add the wine, reduce by half and then stir in the olive oil, chopped chilli and herbs. Dress the rocket and cherry tomatoes with half of the dressing made from the squid pan. Add the fruit segments and make sure all the ingredients are coated with the dressing. Check the seasoning and add salt and pepper if necessary. Place a neat pile in the centre of the plate and then top with the fried baby squid rings. Drizzle the remaining pan juices over the salad and around the plate.